When a child has been diagnosed with a heart rhythm problem, it is necessary to learn more details about its cause. A cardiologist may recommend that the child have a test called an electrophysiology test. This test or procedure will give the cardiologist information about the heart rhythm problem that cannot be learned from listening to the heart, looking at the electrocardiogram (EKG) or be seen on the ultrasound (echocardiogram). Often the electrophysiology information is used to plan for medications or pacemaker placement to treat the rhythm problem. A mild sedative is usually given before the procedure. Xylocaine, a local anesthetic medicine, is injected under the skin at the top of the legs (groin area, one side or both may be used) and collar bone area. After the area is numb, a needle is placed in the vein at the top of the leg and in the vein under the collar bone. The needle is then replaced with a plastic tube, like an IV and called a sheath. The sheath lets the doctor put the catheters in safely and prevents the child from bleeding from the needle puncture. 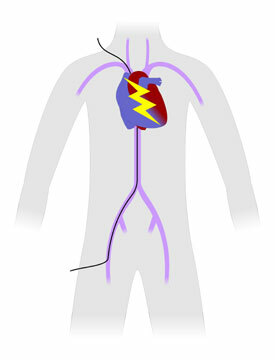 An electrophysiology catheter is a special piece of wire about the size of a piece of thin spaghetti. It shows up on the special xray camera that is used in the electrophysiology lab. The doctor then guides the catheter through the big blood vessels to the heart and uses the catheter to record the electrical activity in the heart. Sometimes the abnormal heart rhythm can be treated in the electrophysiology laboratory (ablation or cardioversion).